1.00 AM Departing LCC Terminal, Sepang, Selangor. 8.20 AM Arriving Incheon International Airport, Korea. My first solo trip outside Malaysia. Well, if consider my trip to a village at Brunei’s border few years back as not really going outside Malaysia (as I didn’t even undergone passport/security check to enter and stay there for a night); we can call this as my first official trip outside Malaysia too. Crazy right? I don’t know why I didn’t took much photo in Incheon Airport. Probably I’m too tired to took out the camera…lol. I took my time at the terminal. Wash my face like normal morning routine (just that I didn’t know where to get morning shower…huhu). We took a train from arrival terminal to boarding terminal (will post picture of this area later during my journey back journal insyaAllah). They have large baggage claiming area. I walk around for few minutes, clueless of which carousel for my fight’s baggage, and I can’t find my beg. I ask the airport staff, and they help me find my beg. Actually, because I was late, my beg was already taken to a side. The carousel will be busy for other flight, so they won’t let the beg on carousel for so long. But the airport staff is really helpful, so please ask them if you need any assistance. Then again, taking my time asking question at the tourist information booth, request for map etc. 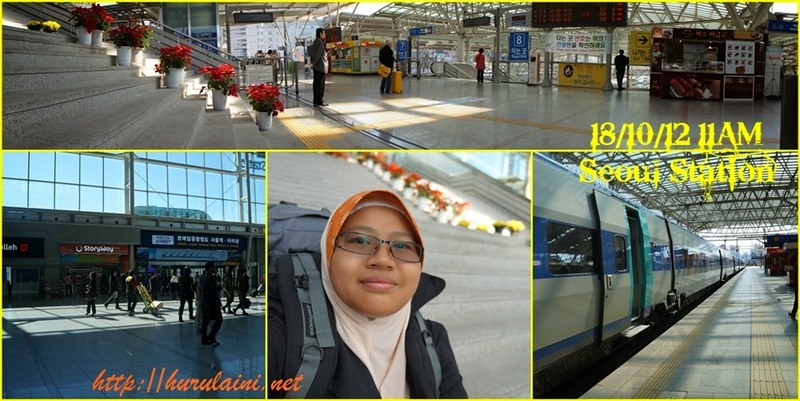 Buy my T-money card, phone card, and train ticket to Seoul Station and Singyeongju Station. You can actually ask the staff at tourist booth to help you to book hotel room if you need too. Deluxe Limousine Bus cost 12,000won – 13,ooowon (about RM35). Standard Limousine Bus cost 7,500won – 8,000won (about RM21). Airport Railroad (AREX) Commuter Trains: Stop at 9 stations between Incheon Airport and Seoul Station; 53 minutes, fare 4,050won. #Price may varies now. RM – KRW conversion is rough estimate based on 2012-2013 conversion rates, rates may differ from time to time. 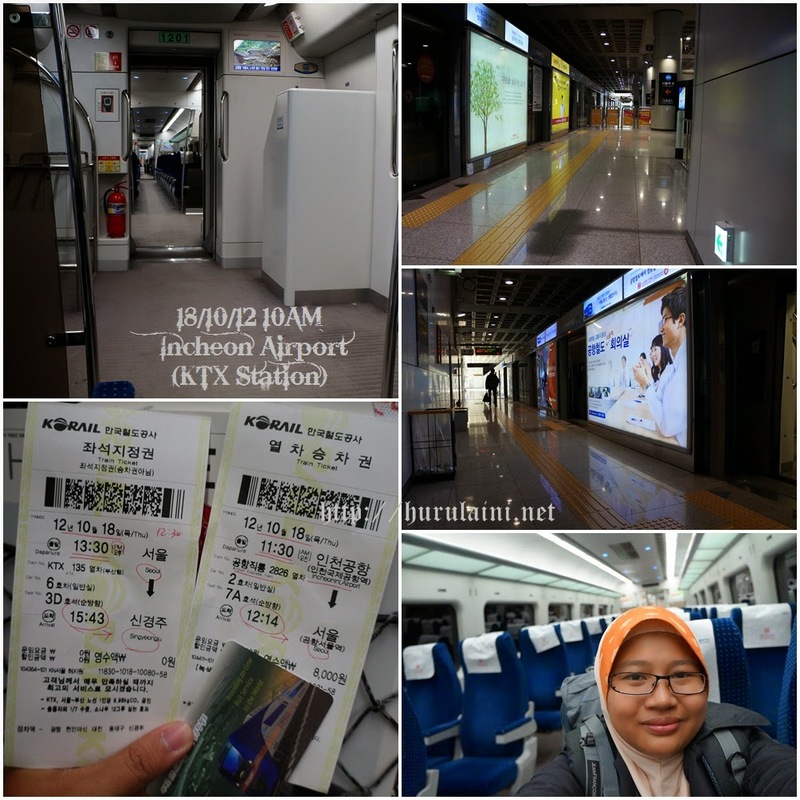 #Read HERE for more on AREX and OTHER METHOD FROM INCHEON AIRPORT TO SEOUL. Just for clarification, in layman term, AREX is ‘Airport Special Line’ (between Incheon Airport to Seoul Station and vice versa; either direct line or commuter line) similar to the ‘Metro/Subway’. Meanwhile KTX is ‘real train’ going from a city to another. KTX and AREX is under KORAIL. Not to be confuse, AREX stop at Incheon Island (where the airport is); while normal subway stop at ‘mainland’ Incheon (Line 1 last stop is near China Town). 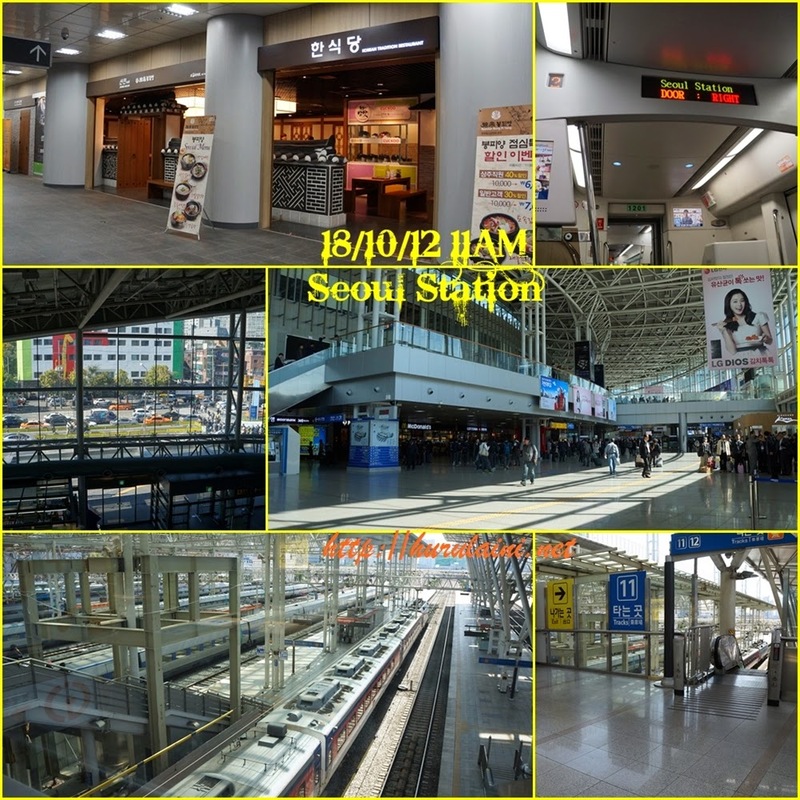 In the above picture, it is ‘Seoul Station’ for KORAIL service (KTX and AREX). It is connected to ‘Seoul Station’ for subway/metro. Look for a sign/direction of ‘METRO’ if you want to use subway from here (it’s about 5-10 minutes walk). I book the 1.30PM to Singyeongju Station as I’m afraid I will miss the 12.30PM train. With heavy backpack, I can’t really walk around the station much. Thus I just wait at the staircase not far from train entrance. Haha…it’s only up until mid-day of my first day here…lol. Will continue my Gyeoungju journey at later post.